VOTE FOR CHARLESTOWN VINTAGE FOR COSMO'S NEXT NEWCOMER AWARD? It's crazy to see Charlestown Vintage up against other amazing blogs in the category, and I still can't get over the fact that it's been shortlisted, so to gain votes would really be a dream come true. Take a look at the other blogs too, they're really good and really deserve it! Thank you ever so much to all of you that take the time to read my blog, leave lovely and thoughtful comments and vote! Time really does fly, I've already been back from my family trip to NYC for 3 days and yet I still can't quite believe that the holiday has been and gone! I had such a good time, I love the city and having been there twice before, it was nice to remember good places to eat, sights to see and just generally know my way around their strange road layouts (although so much more logical than ours and once you can get your head around it, so simple!) We had four days in the city, and I took so many photo's (way too many to include on here, especially as many are pretty dodgy and blurry). We walked everywhere(!) exploring the different areas, I particularly liked Greenwich Village around NYU and parts of the Upper East Side that seemed more residential and it was nice to be surrounded by native New Yorkers as everywhere else was so packed with fellow tourists trying to take in the sights. And on a really hot and humid sunny day, weaving in and out of groups of people whilst trying to take a photo that isn't majorly wonky or blurry is not so much fun! But it's to be expected. New York is amazing, and I love it, it's a city that I could definitely see myself living in at some point, i've even started looking for some sort of paid post-Uni internship! I'm just imagining it now, i'd be in food heaven, and would probably end up living off their marble cake (which I had for breakfast probably a bit too much!) and Shake Shack. If you ever go to New York, I'd really recommend you try it - that's if you enjoy the tastiest burgers (ever!) and thick & creamy milkshakes. Wow. I still can't quite get over just how good it was, why isn't there one in London?! Another thing that I loved about New York which I think we miss over here is their deli-style supermarkets, with buffet salads, pastas, amazing fresh breads and pastries as well as everyday products (but even they were better - with so, so many varieties and all in really attractive packaging - something i'm a bit of a sucker for! ), they even tend to have seating areas on a separate floor. Moving on from the food, there really are some hidden gems of beauty in NYC between the rows of traffic and people, our hotel was in Bryant Park which looked so pretty a night with the twinkling lights in the trees and glass restaurant attached to the library. It was nice to see how many people used it to relax in even late at night, with lots of tables and chairs on the lawns. Sorry about the ranting, it's hard to describe how much I like NYC in a blog post! So now i'm back home, I have a couple of days to relax and plan for Paris where i'm off to next week with Alessio. I'm so excited to visit Paris; the history, the architecture, the museums, the pastries, God i'm going to be in heaven. Me and Alessio have rented a little apartment near the Sacre Coeur, and it looks so lovely in the pictures! I'm also hoping to add more of a historical aspect to my blog, I love history (which I have probably made apparent by now) so I really want that to be more highlighted in my blog. Charlestown's Back to School Wishes! Pinafores, Patent T-bars & Crisp White Shirts;Hello from NYC! When this is published i'll probably be wandering around the Big Apple, eating too many burgers, fries & shakes, and melting onto my tourist guide and camera. Hope you're all having a lovely week, and expect some NYC posts soon!Autumn is my favourite season, by far. I love everything about it, with the evenings drawing in, crisp mornings with a chill in the air, walks among the woods with golden hues, and of course, the clothes. As much as i'm not quite ready to go back to University just yet, i've found myself already yearning for Back to School (or University) pieces. 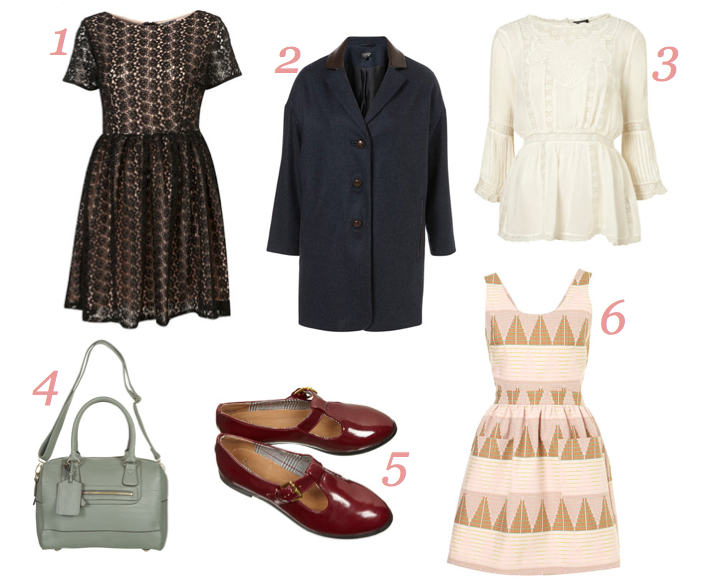 Every autumn I swear it's the same, i'm drawn to school-like pinafore dresses, with patent shoes and satchels. I wish I could go back to school sometimes just to wear my secondary school uniform of pleated skirts, collared shirts and woollen jumpers (even if a little bland and itchy). Another thing that excites me about going back to University is the fact that new stationary is a must, every year I always have to have a new pencil case, pens, diaries, notebooks, the list goes on. I'm planning on dedicating a whole post to my stationery wish-list when i'm back from NYC (organised - yes, lame - maybe).1 I cannot put into words how much I love, love, love this dress! I like the fact that the pattern is crochet as opposed to lace, which, for some reason, seems more autumnal to me (anyone else agree?) I can just imagine this with think tights, patent shoes and a little red bow in my hair. This may have to be my first purchase with my student loan this September!2 You can ask any of my friends/family and they will tell you that I have a bit of an unhealthy obsession with coats. Every year I can't not buy at least one, and in my second year house at Uni I had a wardrobe dedicated to coats only! I love the fit of this one, it reminds me of something worn in the 50's and 60's, and I love the collar too. It would also go with so many of my clothes!3 I have quite a few white collared blouses and shirts, so this one with it's pretty lace detailing and almost Victorian-era styling would be a more feminine top to wear with skirts, pinafore dresses and trousers. I recently saw this blouse on the lovely Olivia Purvis, and it has such a lovely shape!4 I've had my satchel for a couple of years now, and I think it's safe to say that the end may be near. The lock no longer works, and it's a tad on the small side, especially as I now lug my camera everywhere with me. I love the colour of this satchel, pastel/minty green being one of my favourite this summer, and it also would go nicely with grey's and brown's of autumn. It's also big enough to hold all of my dissertation books and folders! 5 Burgundy/wine-red is one of my favourite colours, especially in the autumn and winter as it goes with absolutely everything and reminds me of autumn leaves and toffee apples (strange I know). Topshop sold a similar pair of patent t-bar flats last year and I couldn't justify buying them, but I think I prefer these ones and in this colour they're a little bit different! I've seen them in store in black too, and they look so pretty in real life. I would probably wear them with thick tights, or grey ribbed over the knee socks and dresses. 6 Last but not least, I really love the pattern of this dress, even though it is not something that I would usually be drawn too. I saw it on one of the mannequins in store with a long-sleeved blouse underneath, and it reminded me of something Alexa Chung would wear, or the girls at a private boarding school, ha!P.S. Apologies for everything piece being from Topshop, I went into their Lakeside store recently and I was in heaven. I haven't been too keen on many clothes on the high street recently, but somehow Topshop always seems to just be the shop for me! And it certainly hasn't failed with their autumn-ware. Hope you're all having a lovely week, and i'll be back from NY soon with many photo's and anecdotes to tell,Love, Charlestown xoxo. VOTE FOR CHARLESTOWN VINTAGE FOR COSMO'S NEXT NEWCOMER AWARD? I think it's safe to say that I am well and truly in love with this dress. I was with my sister when I spotted it on the sale rail in House of Frasier but forgot to pick it up, it played on my mind for a while and when I went back a month later there it was, waiting for me! It's everything I look for in a dress, pretty print, cute colours and I love the neckline and detail on the sleeves. 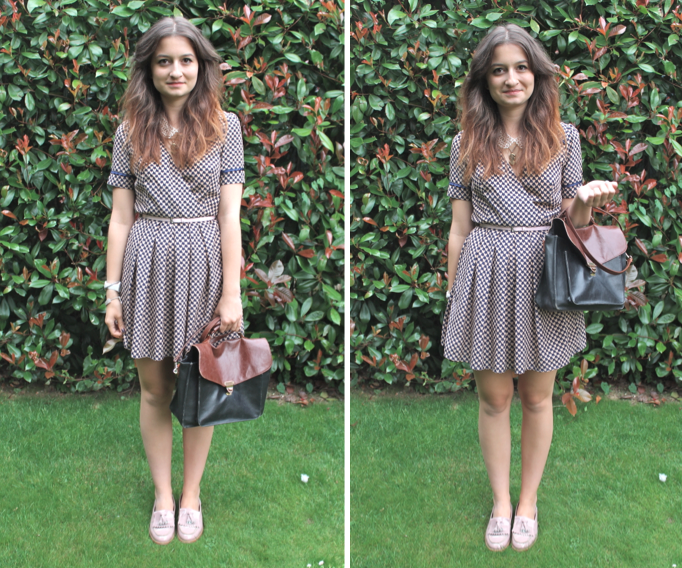 This is the outfit I wore to afternoon tea with Olivia yesterday, I had such a lovely time! She's got such a lovely personality, and we had so much to talk about! One of the best things about blogging is the fact that you find people with similar interests to you and make such good friends! Ah, the strange world of the net. I've packed up all of my clothes and shoes for New York, and am all ready to go. The excitement is finally setting in, and I just want to board the plane already! We leave tomorrow morning and arrive in the late afternoon local time, so we have the evening to explore, I love New York at night with all the hustle and bustle of the yellow cabs against the bright lights of the city. I just wanted to say a little thank you to all of the comments on my last post. I realise that you should blog for yourself, it doesn't matter how many readers/comments etc you receive as long as you have fun in the process! The comments have spurred me on to continue with my blog, I do love my blog, and want to see it progress and just use it as an online diary, so thank you so much for supporting me and just generally being so nice! Thank you, your comments really do mean so much. Sorry this is a bit of a short post, but packing prevails! I'll see you soon, hope you all have a lovely week! Is it bad that I can't wait for the weather to turn a bit more autumnal? Maybe it's because i've spent the last two weeks in a fashion cupboard filled to the brim with burgundy dresses, mustard coloured shirts and wool coats! I also HATE dressing for hot weather, I never know what to wear and i'm useless at figuring out what goes with denim shorts and tiny skirts. I also really don't like having a lot of my body on show as I tend to be pretty self-conscious, so this week later in New York should be fun! 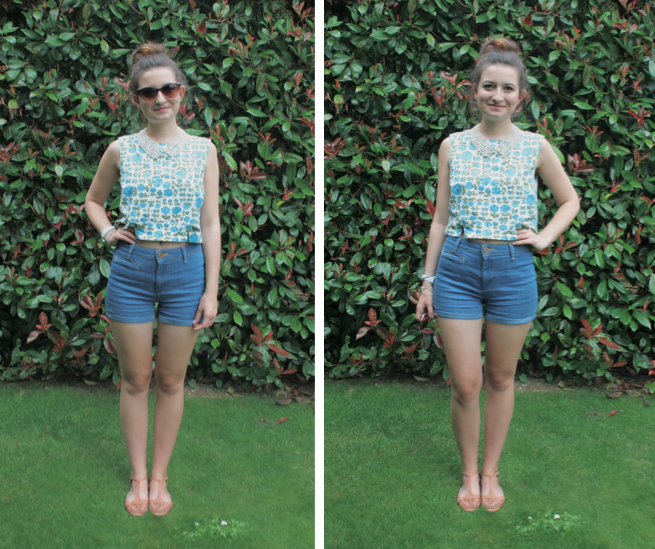 I bought this top in the ASOS sale a couple of months ago, and it was pictured with matching shorts, which I also bought, but I haven't yet gotten round to braving them as a pair, maybe I will in NYC! I'm so excited about visiting the Big Apple, the trip has come around so quickly and i've barely had time to think about it, but i'm looking forward to visiting the museums again, going to the top of the Rockefeller at night and gorging on all of my favourite foods. Sorry my posts have been a bit hit-and-miss lately, it's because I really don't know how I feel about my blog at the moment. It's not how I want it to be, and I constantly feel disappointed with it. 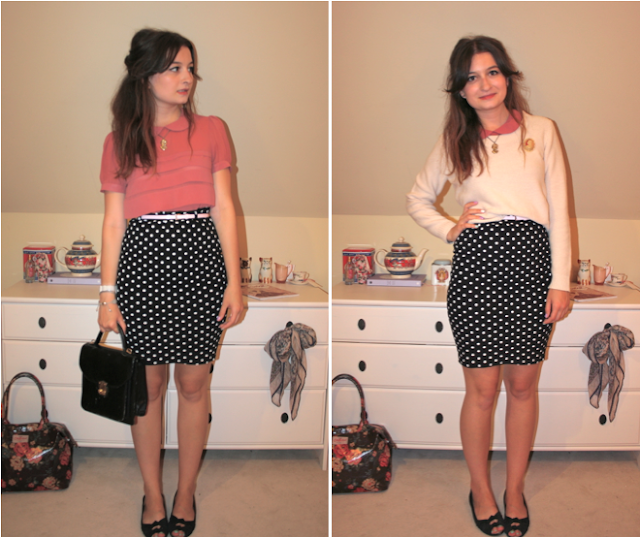 The pictures never end up how I hope, and I never feel that what I do/wear deserves to even be blogged about! There are so many amazing blogs out there, so why should I blog when mine will never even be able to compete. I know it's not all about followers either, but I always get a bit disheartened when I see others with amazing amounts of support that have only just started whilst i've been blogging for nearly a year, and it makes me question whether my blog is actually worth existing - is the content actually interesting enough, pictures enticing? I just don't know how I feel about it, maybe I should just carry on and continue blogging, and hopefully i'll get my inspiration back! But to be completely honest, most of the time blogging just leaves me feeling disheartened, envious and self-conscious. Thank you to everyone who voted for me in the Cosmo award, they're still open; till the end of September! I wore this outfit yesterday, on our family outing to Broadstairs. If you've never been, it's a pretty seaside town with fantastic house-y shops and (my favourite) an ice-cream parlour in all of it's sixties splendour. I thought that I should probably don my best 'sixties siren' outfit, with a beehive, and feel the part with my knickerbocker glory, but the town was so packed that we had to go somewhere else. The sixties is my favourite era, with the music (the Beatles are my all-time favourites) and of course the clothes, but i'm sure lots of people must agree! But oh well, I would still say that this is one of my favourite outfits, even if I have to be extremely careful of what I eat in this mega tight pencil skirt! My internship ends this weekend, and pretty soon i'll be jetting of to New York. The reality of the trip still hasn't sunk in yet, but i'm sure it will do soon enough! Thank you for all of your lovely comments on my latest post, I really need to expand my style in terms of photographs on here, and my last post was along the lines of how I wish my blog to be! Sorry about these not so good photographs, the thunder and lightening reduced me to using my bedroom! Yesterday was spent perusing the higgledy-piggledy cobbled streets of Cambridge, and trying to hide from the torrential downpours under shop covers. It was my second time in Cambridge, I visited earlier this year whilst on my Easter holiday, it's such a lovely city(? ), I love the stonework and architecture, it reminds me quite strongly of Bath, does anyone else think that? Me and Alessio found a traditional English-style tearoom called Harriet's, where I had a much needed cup of tea to warm me up after the rain, and as it soon after changed quite dramatically outside (forcing me to remove my mac), I bought a Salted Caramel ice-cream. I keep seeing Salted Caramel recently, particularly on Taza's blog Rockstar Diaries, and wanted to see what all the fuss was about. And wow, did I make the right decision, it was so delicious, with a slightly salty tang that just stopped it being too sickly (and made it a lot easier to eat!). I've had some good news this week, with my second placement this summer with the Daily Express starting on Monday! I've been sent a list of the sort of jobs i'll be expected to complete, and as it's quite a bit different to my last placement, I'm really excited to get started and see how they compare. Today i'm going to be meeting my best friend, Ash, for a catch-up over Byron's burgers and chips. I haven't seen her in such a long time so it's going to be lovely to find out all about her recent trip to New York! P.S. Thank you to my boyfriend Alessio for these photos!